Cute cows are available in my store. The pinterest inspired board has a quote I came up with: Every Child is a Reader, a Writer, an Artist…a Gift! Love prepping my classroom! After working on and off all summer on new elements for my classroom and students, August 6 rolled around. The summer came to a quick halt with three days of meetings, a new SW PBS Missouri roll-out in our district, and two days of boot camp! Can we say tired??? Gone are the days of unscheduled time. Monday will be a true first day of school with a normal schedule for facilitating learning. Yay! So, without further adieu, My Classroom Reveal! What’s Different about the Room Layout? I have found it is easier to keep kids on task when there is an element of surprise. In other words, be caught being good because you never know when the teacher will be watching. So my teacher desk and small group table are at the back of the room where I have a clear view of activities, work, center engagement and movement. It is a system that works best for me. What About Flexible Seating? Yes! We Have It! Last year, I added to my bucket and crate seating options by also offering wobble seating (through @DonorsChoose.org ), yogo mats, student chairs, lap desks, cushions and a low table, a plush rug (our mud puddle), and small folding chairs. This year’s goal is to add more wobble seating from http://www.wobbleseat.com/ . Having the ability to wiggle why we work is a positive for maintaining focus. Here is a photo looking across my room at our flexible seating. This photo will be updated with the new arrangement soon. 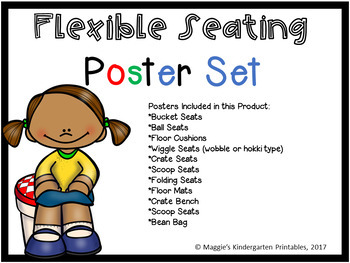 Need some posters to teach your seating options? Find them here. My centers approach is based on the Daily 5 components: Read to Self, Read With a Partner, Work on Words, Work on Writing, Listen to Great Literature, and Meet with the Teacher. To these options, I have also added a row of tubs that focus on fine motor–an essential area that needs worked on most of the kindergarten year. Student centers are coded with a farm animal to indicate that group of tubs is related to one of the components. Each day, students choose two farm animal centers. At the break, we clean up quickly and move to the next center. Here is a photo of my centers board. It is made from a large automotive drip pan and cards with magnets. I will meet with two-three small groups, or call over individuals depending on the lesson for that day. My other small group(s) will meet during rest/assess time after math in the afternoon. Here is a view of our center tubs. If the center is not in a tub, the same icon will be in other places in the room. There are at least six choices for each genre. Our listening center is a tub of cassette tapes paired with books. This is an antiquated, but successful station for two at a time to listen. My ipods will no longer charge, but ipods are a good option for single listeners. Here, you will find our narrow long table with bucket seating. The bucket seats help students sit higher with a clear view of activities during our small group time. I use Chipper Chat later in the semester, but do many things with alphabet and magnetic chips and wands. This is our area for assessing the letters we know. Behind my table are color coded sight word sets for each student. As a student learns a word, I put a dot with a sharpie on the card. This helps keep track of how individuals are doing. Last year was the bench’s debut. My students loved to sit on it to tie their shoes. The little animals in the bench are pillows that fold to make farm animals. Love them! This year, I decided to retire my farm animal lanterns, and replace them with cute tissue balls. I ordered black and white ones. These are hung randomly with black satin bows on top! The effect is so cute! I am loving this combination journaling, @Seesaw reading/recording station. Soon, writing object cards will be added to the station. Students can choose to write about a “boo-boo”, tell about something in their day, or read our alphabet chart while recording themselves in Seesaw. There are also Level A readers for pointing to the pictures, then the words. Repetitive text in these books will be taught, then students can go practice reading. This was before the seat covers were permanent. Tack Shed! A place to hang our backpacks and coats! My room didn’t have a good double coat hook area, so with permission from our custodial staff, my hubby build a nice double board hanging center. Simple and just right! Something that is not visible are the Seesaw icons with each child’s name card. This really helps kids to find their name when they are unsure of what it looks like. Everything with student names matches their Seesaw icon. I spent time color coding our Twistable colored crayons this school year. Every year, we have one or two students who hoard all of them! LOL This can be the bane of your existence if you are trying to have small groups while students are finishing illustrations. For that reason, it was a must! This should be a non-issue now! Novelty is Key in Center Activities! 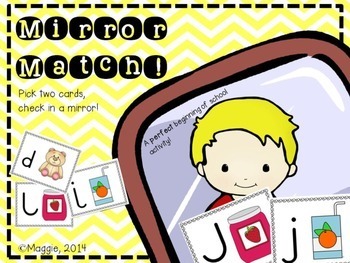 Each year for the past three years, I have pulled out my mirror image alphabet cards. As you can see, they are all backward. How does one see them forward (stated in a “Winnie the Poo-ish” way)? You hold the card next to your body facing out. Then you stand in front of a mirror, or hold a mirror in front of you. The letter will be facing the correct direction for you to record on a dry erase board. State the letter, and move on to the next backward card. My kids love this center! You can find it here . Another favorite center activity (as you see being prepped below), is the huge letter stamping center. Students can choose to stamp their name in large letters, or practice stamping the letters we focus on during the week. Either way, we love it! And, the beauty of this center is the fact the paper is recycled backs of pages from our charting sessions! The stamps we use are here. Students use their name plates as a guide for names. That’s it for today. If you have questions about anything you see in my room (chartlet stands, chart stand, table decor, signs, alphabet set and more), just comment below. I hope you have a wonderful school year! I know the changes I have made are already helping things go smoothly. Let me know what you think! The trace and build with pom pom letters are great! EXCEPT, there is a mistake on the letter F page… it has letter F and letter e lowercase instead of f… is there a way to fix that and let me know when it’s fixed so I can re-download that?